Samsung is helping people around the world enjoy seamless, intuitive lifestyles with innovative printing technology. And through these technologies, Samsung is leading the mobile printing market. Last year, 300 Samsung multifunction copiers armed with Near Field Communication (NFC) technology were installed at the Doha International Airport in Qatar. Travelers can use these NFC printers to print tickets or other travel documents. Users found this service relieved them from the pain of searching for a wireless network at the crowded airport. Korean International School is also using Samsung’s cutting-edge cloud printing solution to enable students and teachers to easily print documents virtually anywhere, with any device. When we combine NFC technology with printing, the result is a simpler mobile printing solution. As long as your mobile is near your printer, you have the ability to print, even without a computer. Intelligent technology makes it easy-to-use, and simplicity is its biggest benefit. Mobile printing with NFC technology works in a very straightforward way. To activate it, tap the NFC icon on your device, place your phone near a printer for NFC tagging, select the document or image, then print. This works with any NFC-enabled printer, not just your own. Images can also be uploaded to cloud storage by using an NFC-enabled scanner. After the release of smart devices in 2010, Samsung introduced a variety of innovative mobile printing solutions to the market. In 2013, it launched the world’s first NFC-enabled color laser printer, which created strong momentum for Samsung to solidify its market leadership in the mobile printing world. Samsung is now using the NFC mobile printing function for almost every printing solution. 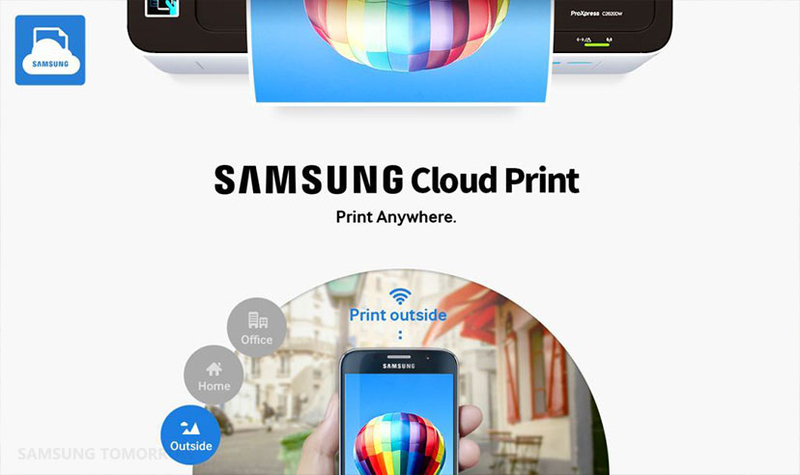 Samsung launched Samsung Cloud Print Public on May, 2015. Because business is often conducted while on-the-go, users can print securely wherever, whenever from their mobile devices with Samsung Cloud Print. These versatile solutions provide users with remote printing from a phone, tablet or PC, as well as file sharing between phones and sending documents by fax from a phone, all performed simply and seamlessly. 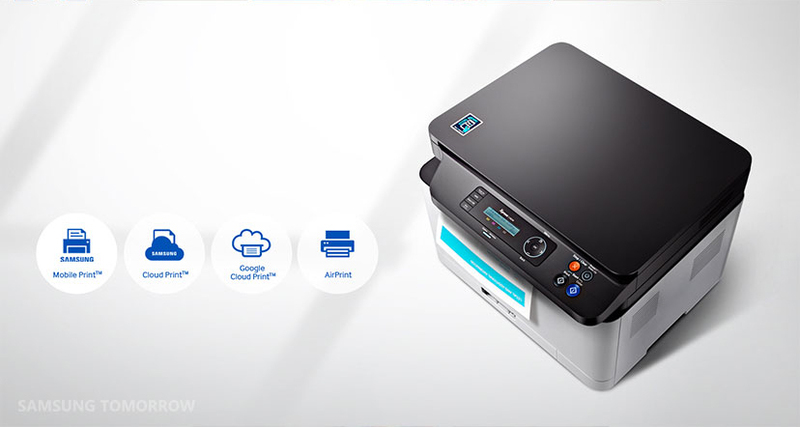 After unveiling Samsung Cloud Print, the company opened new business opportunities within various verticals, providing them with invaluable printing solutions. Samsung is strengthening its mobile printing leadership by partnering with other innovative firms who have technological expertise. 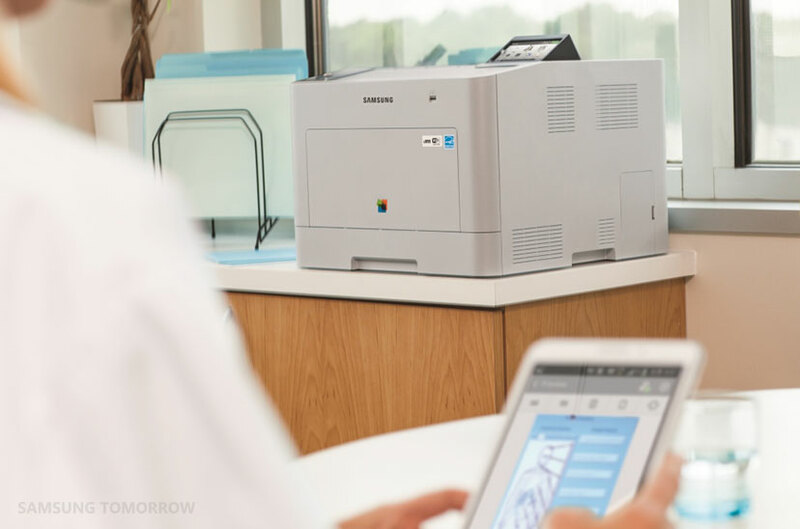 Last year, Samsung acquired PrinterOn, a pioneer in mobile cloud printing solutions, which reinforced Samsung’s mobile ecosystem and delivers enhanced solutions. Samsung is currently working with a mobile network operator in Europe to develop a cloud printing and charging solution based on the Samsung Cloud Print platform. The mobile and cloud printing solution boasts speed, image quality and convenience. However, this is not the end of story. Multifunction printers will soon double as an enterprise security solution. Early next year, the NFC-Pro (tentatively) will be launched. It supports simple, tag-based user identification and thereby can serve as a security solution. Office workers usually scan their employee cards to enter businesses, but this requires unnecessary expenses of installing card readers. The NFC-Pro enables a printer to identify employees entering via smartphones. Samsung continues to develop the most convenient and easiest mobile printing solutions, which will offer the greatest value to every mobile device user.